Hey all! I love when Zoya comes out with their Spring collections because I am a sucker for shades like these. 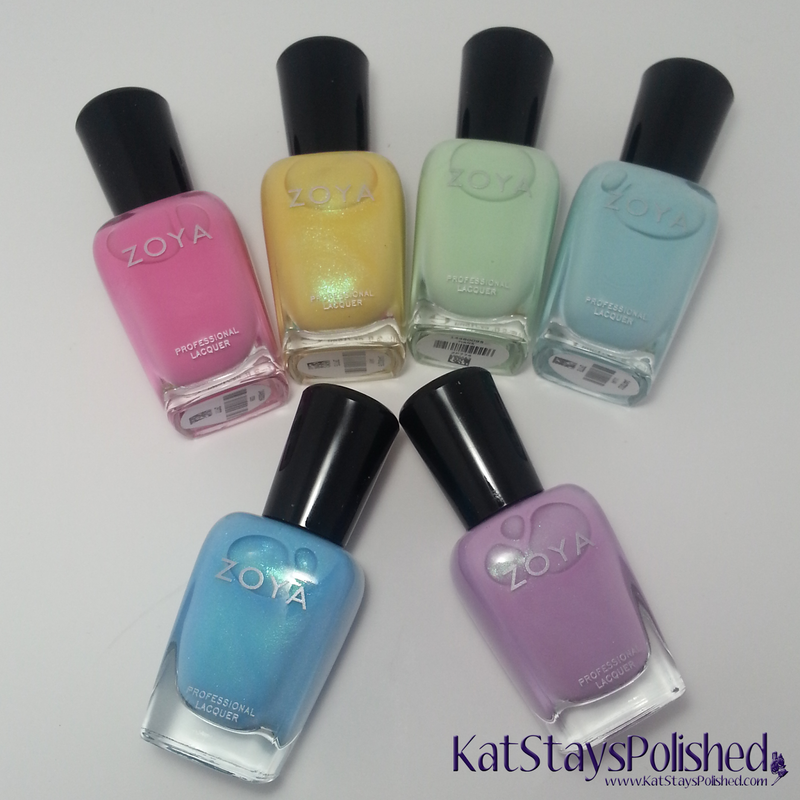 Have you gotten your hands on the Zoya Delight collection yet? If not, check out my swatches and review below! Eden is a very creamy pink perfect for Spring. It applied beautifully in 2 coats and is topped with KBShimmer Clearly on Top. I always love the application of Zoya creams. I've rarely had any issues with them. Daisy is described as a merengue yellow mettalic. I have a friend named Daisy and she likes Zoya polishes. I wonder if she's gotten this one yet. I used 2 coats for this and top coat. If I had applied a third coat, it would be 100% opaque. I kinda like it the way I have it shown though. Tiana is described as a pistachio gelato green and that's exactly what I thought even before I read the description. I love this green anyway because it leans on the minty side and you know I love my mint polishes. This is 2 coats and topped with Clearly on Top. Adding a top coat really does hide any imperfections you may have during application. Lillian is described as being a faded aquamarine. I still see a sky blue to this. Whatever it is, I freaking love it. Applied in 2 coats without any issue and is the perfect creamy consistency like I've come to know from Zoya. Rayne is a gorgeous spring blue metallic/shimmer shade. I love polishes like these because they add just a tiny bit of sparkle to any mani. I used 2 coats, but like Daisy, if I had added a third coat, it's be pretty close to opaque. I like the bit of sheerness it has though. Last here is Leslie, a soft lavender metallic/shimmer. Show is 2 coats plus a top coat. It appliessly, of course. I'd wear this shade all season...heck, all year long! I love it! What do you think? Do you like pastels for Spring or are you tired of shades like that every season? Let me know what you picked up!